Former Fleetwood Mac guitarist Lyndsey Buckingham is taking his estranged bandmates to court, accusing them of breach of contract in the latest fallout from his acrimonious departure from the band. 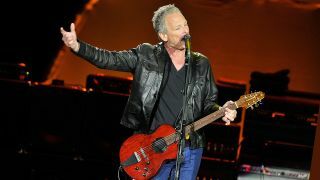 Buckingham was removed from the line-up following scheduling disputes ahead of the band's forthcoming 50-city tour, a jaunt he claims would have earned him somewhere in the region of $14 million. The lawsuit, filed in Los Angeles earlier this week, claims his former bandmates “intentionally acted to interfere with Buckingham’s relationship with Live Nation and the prospective economic benefit he was to receive as a result of his participation in the tour”. Buckingham was dropped from the tour shortly after a Grammy MusiCares event, honouring the band, in January. “Less than a week after having shared a stage at MusiCares, the other members of Fleetwood Mac had suddenly cut Buckingham off entirely,” the filing continues. The guitarist has now been replaced in the band by Mike Campbell from Tom Petty and the Heartbreakers, and Neil Finn. Drummer Mick Fleetwood had played on Finn's latest album, the excellent collaboration with his son Liam, Lightsleeper, before the decision to drop Buckingham. When we spoke to Neil earlier this year, he told us how those sessions eventually resulted in an invitation to join the tour. “It led to it, for sure. It certainly led to it I think, because that experience was fresh in his mind. I never saw it coming in a million years. He was obviously thought that it was in my sphere and I was flattered by that. “They’re an amazing band. He and John McVie are one of the best rhythm sections ever and then there’s Christine and Stevie’s voices. So when he asked me, I was completely shocked, really."